5 Ways To Protect Your Cottage | Calgary Alarm Inc. There are over 200,000 break-ins and thefts reported every year in Canada, most of which are residential. Cottages are particularly prone to break-ins, especially over winter when they’re left unattended, and there are fewer people to witness the crime. Doors are the main point of entry. It is also less conspicuous for a thief to walk through a door than to gain access through a window, plus it is much easier to leave with stolen items. Many doors are not as secure as you think, so buy a good solid door to specifically keep burglars out. Just as important is a solid and substantial frame to offer more resistance. Replace all doors with glass panels, secure them with deadbolts, and consider even fortifying the glass. Also, secure the patio door. Even if police officers may not arrive in time to prevent a thief from escaping with your items, it can act as a great deterrent. 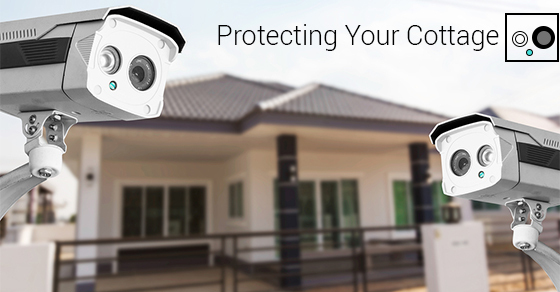 Make sure that all wiring is well hidden, because a skilled thief will look for points to disconnect the security system. They help to give the impression that the cottage is occupied, plus keeping the property well lit at night makes it easier for neighbours to spot any suspicious activity. Of course, you need to notify them of your movements, and perhaps pay someone to maintain the house. Valuable equipment and expensive equipment should not be left outside or in plain view through a window. If you plan on being away for a long time, take electronic equipment, alcohol, and firearms home with you or keep them in protected storage. If you have a canoe, boat, or other personal watercraft, move it from the shore to some place higher up on the property out of sight from passing boats. Community policing is a great way to involve your neighbours in protecting all properties in your community, plus it makes your neighbours more alert of suspicious activities. Also engrave your name or identification number on expensive equipment to discourage thieves, and put ladders and other furniture stored away so they’re not used to facilitate entry. Thieves are usually looking for an easy way to make a lot of money. So, anything you can do to slow them down or make it more difficult to rob your cottage should be enough to deter thieves.